Elegant is the single word that perfectly describes this bright and beautiful bridal set. The classic three stone layout makes this a timeless design, while the straight diamond wedding band can easily be worn alone. 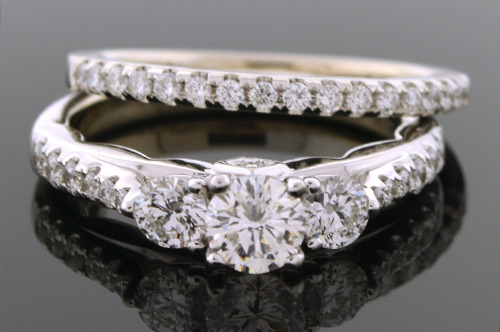 A unique scallop design is hidden on the underside of the diamonds while the ring is being worn. This subtle detail will be her own until she chooses to shares it. The engagement ring hold one round brilliant cut diamond that has a weight of .43 carat. This diamond has a color grade of H-I and a clarity grade of VS(1-2). This diamond is flanked by two round brilliant cut diamonds that have a weight of approximately .35 carat total weight. These diamonds have an average color grade of H-I and an average clarity grade of SI(1)-I(1). Accenting the engagement ring are 14 round brilliant cut diamonds that have a weight of approximately .20 carat total weight. The matching wedding band holds 17 round brilliant cut diamonds that have a weight of approximately .20 carat total weight. Made of 18 karat white gold this wedding set is currently a size 7 and can easily be sized up or down.